To raise awareness for the Florida Everglades, Miami-based artist and photographer Lloyd Goradesk created, Gator In The Bay, a colossal floating reptile – a giant 100 foot gator, the length of a football field. You may have caught it last year, if not, look over this December to the waters of Biscayne Bay from the Miami Yacht Club on Watson Island when Art Basel Miami Beach rips into town December 5-8th. 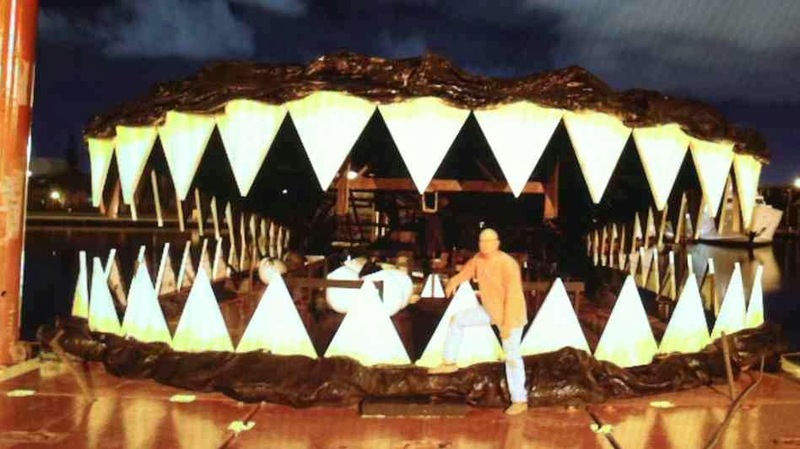 The body of the gator is another masterpiece altogether, which consists of 102 tiles, each four feet wide and eight feet long, made of highly buoyant material that Goradesky calls “floating art tile”. Each of these 102 tiles or sections of the animal’s body is emblazoned with 5,000 unique, postage-stamp size images that create the illusion of an alligator when seen from afar. Goradesky used more than 100,000 digital images that he shot in the Everglades for the gator’s body. It’s one of the largest photo mosaics ever created in the world. If you look closely at these images, you’ll see turtles mating, otters eating fish, panthers on the prowl, and everything else under the sun that goes on within the ecosystem of the Everglades. This major public art project has been in the making for nearly four years and has cost $700,000 to develop. Goradesky partially funded a portion of the project himself and received help from sponsors, Vern and Marie Nix (V&M Erectors) and Warren Fronte (Fronte Crane Service). The ‘Gator In The Bay’ project is intended to raise awareness of the fragile nature of the Florida Everglades and reflect the cooperation between industry and the local environment. Goradesky has been photographing wildlife in the Everglades for more than two decades. 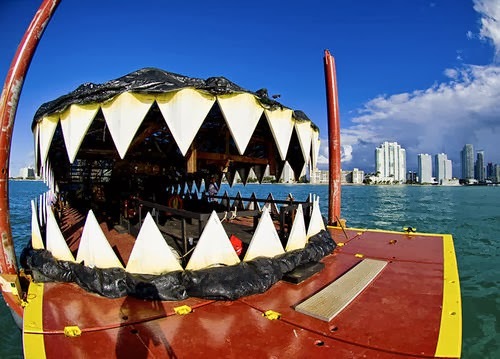 Last year he showed the head of the gator during Art Basel, but this year the public can experience the completed “Lego-style” shape of the alligator as it floats on Biscayne Bay. Goradesky chose the iconic reptile for his Basel opus because the creature is a barometer of our ecological health. One of the 102 tiles is currently on display at The Gallery @ McCormick Place in Downtown, Miami. The tile is stunning and massive, to be able to see this 4 ft. x 8 ft. piece in person is an amazing experience – you can begin to visualize the scope of the project from simply viewing one tile, and appreciate the beauty of the mosaic collage of Goradesky’s images of the Everglades, which collectively create the “skin” of the gator one tile at a time – simply sublime.